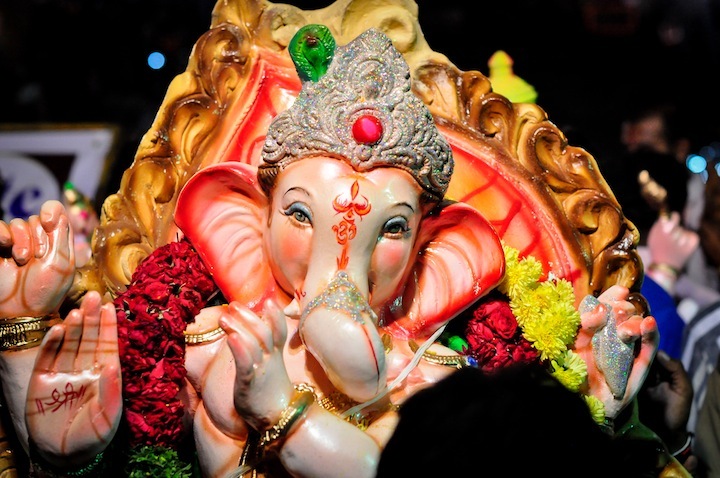 Ganesh Chaturthi is a hindu festival that celebrates the birth of hindu god Ganesha. Ganesha is considered as god of wisdom and prosperity and is often invoked at the beginning of ceremonies, new ventures and travel. A clay model of Ganesha is made weeks in advance, the size can vary from few inches to over 70 feet. The festival begins by installation of the Ganesha idol on raised platforms at home or in elaborately decorated outdoor tents called pandals or Mandapas. Local communities often pool together resources to build the Pandals, where the entire community gather to offer prayers and celebrate. During the festival people offer prayers and conduct cultural programmes everyday. The cultural programmes differ based on the region and has a lot of local flavour. The festival ends with a ritualistic see-off for the Ganesha idol by immersing it in a water body, this ceremony is called as Visarjan. The Visarjan can happen 1,3,5,7 or 11 days after the idol was installed. The festival is celebrated with a lot of fervor in Indian states of Maharashtra, Gujarat, Karnataka, Andhra Pradesh, Goa, Orissa and Chattisgarh. According to legend Goddess Parvati created a boy out of the dirt of her body and breathed life into him. He was assigned the task of guarding the door while she bathed. When Lord Shiva (Parvati’s husband) returned home, the boy stopped him at the entrance not knowing who Shiva was. Enraged Shiva sent Ganas or demi-gods to vanquish the boy. The boy defeated the Ganas, angry Shiva severed the boys head. Soon Parvati found out what had happened and was distraught and angry. Seeing Parvati angry and inconsolable, Shiva promised that the boy would live again. He sent the Ganas to fetch a head facing north, but they only found a head of a dead baby elephant facing the north. So they severed the head of the baby elephant and brought it back to Shiva, who fixed it on the boy’s body and brought him back to life. Shiva declared the child as leader of Ganas, thus the name Ganesha from words “Gana” and “Isha” meaning lord of Ganas. The story of Ganesha teaches the essence of Vedanta, which attempts to summarise the teachings of ancient Hindu scriptures, the Vedas. In the story Ganesha was manifested out of the divine essence of Parvati and found his place as lord of Ganas with a head of an elephant and body of a human. This is to remind that we are all made up of the same, all pervading divine essence or spirit despite differences in shape or form. The ritual of Ganesh Visarjan where one dissolves the clay idols in a water body, is in remembrance of the divine as a formless reality beyond the manifested form one worshipped during the festival. As a visitor or a traveller, your best chance of participating in Ganesh chaturthi are public pandals erected by local communities. The pandals are adorned with elaborate decorations, often the decorations have themes and reflect social issues or current events. Pandals will also organise Poojas and cultural programmes. Another opportunity to participate is during the Visarjan, large pandals organise processions where people sing and dance with much love and fanfare. If you don’t know of any pandals then just head to the Visarjan spots in the city or town you are in, you will be able to feel and experience Ganesh Chaturthi. In Mumbai you can head to one of the 5 famous community Ganesh pandals, to participate in the Visarjan head to Juhu beach or Chowpatty on Marine Drive. In Bangalore you can visit Yediyur lake, Sankey tank or Ulsoor lake to partake in the Visarjan. In Delhi one can head to the G S Samaj pandal in New Rajinder Nagar.